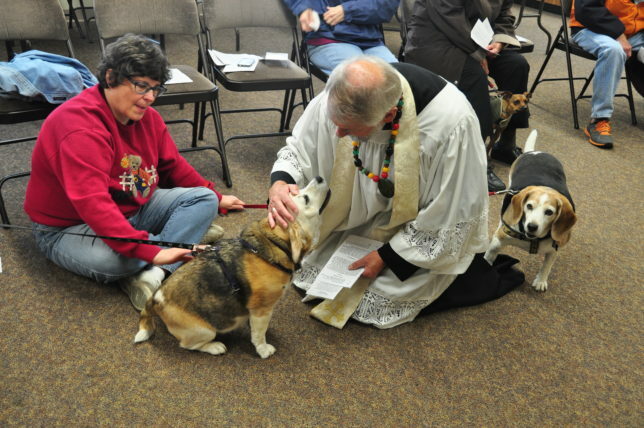 Every Autumn, the congregation of St. Alban’s Episcopal Church invites members of the community to join them in asking God’s blessings on pets and their friends. The brief service includes scripture readings and prayers in addition to the individual blessing of all those present. The 2016 pet blessing will be Sunday, October 2 at 12:30 pm. Animals should be leashed or suitably restrained for the comfort of all. There is strong medical evidence to reinforce the belief that a good relationship between humans and other animals is beneficial for the health of both. The celebration of the life and ministry of St. Francis reminds us of this relationship as well as our responsibility as God-given stewardship of creation. Thus a long-standing tradition of honoring creation and its inhabitants on or near St. Francis Day has developed. Francis was a late twelfth and early thirteenth century cleric who founded an order of monks, calling both church and society to live a more simple life and to care for those in the community who were hungry and needed shelter. His vision was of a world in which God’s beauty and compassion would be seen by the way in which humans interacted with one another, with the animals around them and with the earth itself. At the blessing service we also remember those creatures which may be threatened or close to extinction. Sometimes people bring stuffed animals to represent others unable to be present. All are welcome to attend and participate, with or without animal!